This blog post was first published on Views from the Centre. A more pressing problem seems to be the low demand for finance for education. Reducing the price of borrowing might help at the margin, but this is unlikely to be sufficient. The problem seems to be that while investment in education produces big social returns, these are not thought likely to produce sufficient fiscal returns to repay loans on a realistic timescale. To increase demand for education finance, donors could have more impact by monetizing the social returns—for example, by promising to pay for outcomes. This would increase education finance, and respect country ownership, while reducing the risk for donors that they might otherwise be financing ineffective programmes. The Education Commission, chaired by Gordon Brown, UN Special Envoy for Global Education, makes a strong case for why more money is needed for education. As common sense suggests, education enriches lives, increases incomes, and builds societies. This intuition is embodied in the new World Bank Human Capital Index, which relates education and health to incomes. But, as the Education Commission has highlighted, we have a learning crisis across the developing world. Learning standards in low income countries are 100 years behind high-income countries. The Commission projects that it will take until the year 2100 for all countries to reach the global goals for education and for all children to complete primary and secondary education. Despite this pressing need, support for education has not kept pace with other international aid spending (such as global health). Nor has domestic spending been sufficient to fill the gap. First, returns to education investment are long-term. Though learning outcomes can be achieved in the medium term, benefits for the economy and society materialize later, as the educated cohort become adults and join the labour force. Governments with politically-shaped time-horizons may not place much weight on those future benefits, and may not be inclined to borrow money to invest in achieving them. Second, the fiscal returns may not fully reflect the broader benefits to society of education—and it is fiscal returns that are needed to repay government debts. In countries in which growth is constrained by many factors, and with a relatively small formal sector to tax, the impact on public finances of better educational outcomes could be less than is needed to repay the debt. This can be a problem which constrains investment in social sectors generally, not just education. This disincentive for borrowing for social spending is why developing countries prefer to finance health and education using their own tax revenues and grants from global funds rather than loans from the multilateral development banks. Among the background papers the Education Commission commissioned in 2016 was an ODI report on this very issue, supported by a survey of World Bank borrowers and country directors. The second highest reason given for a reluctance to borrow for education was the lack of offsetting fiscal or fee revenues. The top reason (in terms of a large majority either agreeing or strongly agreeing) was that, “there is overwhelming competition for limited (MDB loans), especially from sectors with a clearer cash flow” (italics added), which is another way of framing the same concern. This suggests that even if there was a way to increase the supply of loans for education, there would still be a constraint on the demand side. It is good news that many countries are becoming rich enough to graduate from concessional lending to borrowing at commercial rates. As their cost of borrowing increases, and with the risk of another debt crisis hovering over the developing world, it is not surprising that governments are reluctant to borrow for investments with uncertain fiscal returns, including social spending such as education and health. That’s a problem on the demand side, which a proposal to increase the supply of finance seems unlikely to dent. 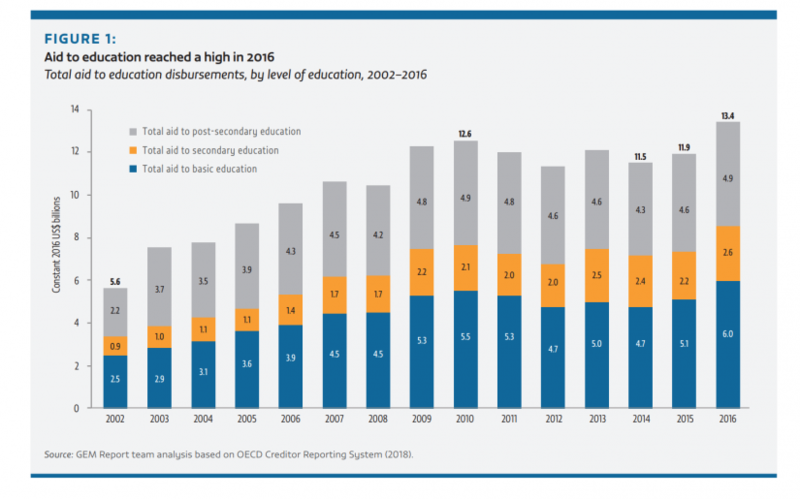 Aid for education has fallen as a share of total aid, and education aid has been somewhat flat in real terms since about 2009 (though as the graph below shows, it was at an all-time high in 2016). The relative decline of education as a share of aid is surprising, since education is typically a politically popular cause for aid donors. One possible interpretation is that donors feel more confident that spending on health will produce demonstrable results, whereas it is less clear that pushing more money into flawed education systems will fix them. It is certain that as education systems improve and grow they will need more finance from somewhere; it is far less certain that providing that finance will cause them to improve. What would the International Finance Facility for Education do? To address this challenge, the Education Commission first recommended the International Finance Facility for Education (IFFEd) in its September 2016 report, The Learning Generation. It is an ingenious idea. Donor countries would issue guarantees worth about $2 billion to IFFEd. (In many countries, according to the prospectus, these guarantees would not count as public spending, at least not until or unless they are called). Based on these guarantees, IFFEd would make a capital-like instrument available to multilateral banks, provided that the banks leverage this capital with additional borrowing in the market, and use the extra lending capacity for “new and additional” education loans. This would enable the banks to increase their lending by about $8 billion while remaining within the risk appetite prescribed by their shareholders. The Commission envisages that this additional lending for education will be blended with new grant funding (they also expect this to be $2 billion). This grant funding would be used to soften the terms of the $8 billion of loans. So an extra $8 billion of concessional education lending would be generated by $2 billion of donor grants, plus $2 billion of donor guarantees which might or might not ever be called. This blending of grant finance with loans, and a switch from commercial loans to borrowing at lower rates from MDBs, would reduce the overall cost of loans for borrowers. The result will be an increase in the supply of MDB lending, earmarked for education, at a lower price than commercial borrowing or other MDB loans. Third, the mechanism does not automatically drive funding towards successfully implemented education programmes. It pushes money through the MDBs—whose staff may indeed be better placed than most to make a hard-nosed assessment of the likelihood of success. But it does not envisage a significantly new performance-based allocation of finance. Fourth, there is already a mechanism to increase the lending capacity of multilateral development banks: increase their capital. MDBs can borrow from capital markets because they are backed by donors through a combination of “paid in capital” (which is about 5-10 percent of MDB capital) and “callable capital” (the other 90-ish percent) which the donor guarantees to provide if the bank’s resources are exhausted. So far, no MDB has ever had to draw on its callable capital. If the IFFEd capital has the same seniority as the other capital subscriptions, then it is financially the same as a group of donors increasing their callable capital, but without the usual discussions of burden sharing. .
Fifth, if donors are willing to generate additional resources for lending or grants to developing countries, it is not clear why we should restrict this additional funding to education. Why not do the same for job creation, family planning, or access to energy? There is a general consensus that aid is most effective when countries determine their own priorities, rather than when support is conditional on countries responding to donor conditions and preferences. By making a capital increase for multilateral banks conditional on future loans being available for particular purposes, IFFEd would set an awful precedent that could easily lead to an accumulation of earmarks and conditions for future multilateral lending that would greatly undermine the principle of country ownership—as they have in the earmarked trust funds. It is not at all clear that it is desirable to import these distortions into core balance sheet operations of the multilateral development banks. lack of certainty that more money will result in better education outcomes. It does not seem obvious that increasing the supply of loans for education, albeit more cheaply than commercial borrowing, will do much to address these. If this diagnosis is correct, then the prescription of increasing the supply of loans for education, albeit at rates slightly below commercial borrowing, does not seem likely to succeed. More promising would be a class of approach that addresses these challenges directly: the international community should find a way to turn education outcomes into more immediate fiscal returns. A mechanism to monetize education outcomes would make education more investible for governments, because it would also provide quicker fiscal (not just social) returns, and those returns would be quicker and more certain than if the government was waiting for the impact of better education on economic growth. This creates a more immediate financial return for investments in education systems, and in doing so makes it more likely that governments would be willing to invest in education. These could be part-funded through MDB loans, if countries want them, which would then be quickly “bought down” or bought back entirely, by results-based grants. The results-based debt buyout for polio, financed by the Bill & Melinda Gates Foundation, is a good example of this approach. Nor would such a mechanism need to repay the full costs of investment in education: if the fiscal benefit of education outcomes could be made a little quicker, a little bigger and a little more predictable, that could be enough to tip the finance minister’s decision towards investing in education. A donor mechanism to improve the fiscal returns to education outcomes could be calibrated to leverage as much additional investment as IFFEd. Such a mechanism should be an attractive way for donors to increase finance for education, because outlays would be dependent on education outcomes actually being achieved. This reduces the risk of donors pumping money in to education systems only to find that lack of finance is not the binding constraint—which seems to be a risk that is holding donors back from increasing finance for education today, as well as holding back finance ministers from taking out loans for the education system. There are several possible ways to monetize education outcomes, including the Education Outcomes Fund, which is also promoted by the Education Commission. This mechanism would reward successful interventions through a pre-agreed price per outcome (for example, number of students sitting an accredited school-leaving exam), using pooled funds from both aid and philanthropists. But the current design of the Education Outcomes Fund is far from ideal: notably because current thinking focuses on providing financing directly to non-state actors. The international community should be agnostic about the mix of state and non-state providers: that’s a decision for the country to make. We should be willing to monetize the social returns to education however the country chooses to deliver them. There is currently no proposal to provide fiscal benefits to governments that enable them to monetize education outcomes. The Education Commission’s proposals for IFFEd and an Education Outcomes Fund are also being met with healthy scepticism about the need to create yet more new financial mechanisms. Ideally these approaches could be pursued by existing vehicles. If the goal is to increase lending by multilateral banks, then an increase in callable capital could be provided directly without creating a new institution. If donors were persuaded that they should provide large-scale outcomes-based funding for education, then they could make use of an existing multilateral grant pool, the Global Partnership for Education (GPE). If GPE does not have the mandate or skills to do this, it would be better to improve it than to set up another parallel fund. The Education Commission’s IFFEd: Right diagnosis, wrong medicine? The Education Commission is right to raise the alarm about the learning crisis, and the lack of funding to address it. But their prescription does not follow from their own diagnosis of the problem. The problem seems to be on the demand side. Governments do not want to borrow for education, for respectable reasons, even more so with an eye to a possible debt crisis. 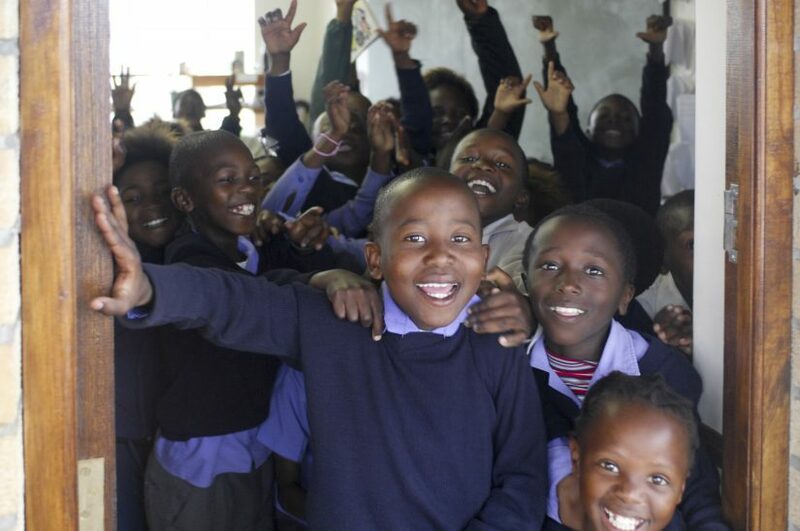 Donors could increase finance for education by creating fiscal returns linked education outcomes, so leveraging their aid to enable more investment in effective education programmes. That is likely to be preferable to creating new financial mechanisms aimed at pushing a bigger volume of loans on unwilling borrowers, irrespective of performance. Our purpose is not to undermine the pressure for more effort on education, but rather to nudge well-intended efforts towards better ways of achieving this goal. We understand that the best approaches are not always possible. Donor commitments to turn the long-term, social benefits of education into shorter term fiscal returns (e.g., through an outcomes window at GPE, a new Outcomes Fund, or in some other way). Donors provide conventional grant funding for education, bilaterally or through existing multilaterals such as GPE. An increase in capital for multilateral banks to enable them to lend more, preferably with fewer conditions than envisaged by IFFEd. A new International Finance Facility for Education.